Warning: this cure makes bacon that tastes better than any you have ever had, and it will ruin all store bought varieties for you forever. Curing bacon is not hard. Artisans on the Food Network have the general public thinking that it’s a grand undertaking. While this may be true for the entrants in the Bacon World Championships – who say, “Bacon is no longer just a food…it’s a way of life” – you can cure mouthwatering bacon all by yourself at home, even if your home is a bare bones studio apartment where the toilet is three feet from the stove. I think what intimidates people is the cure time. 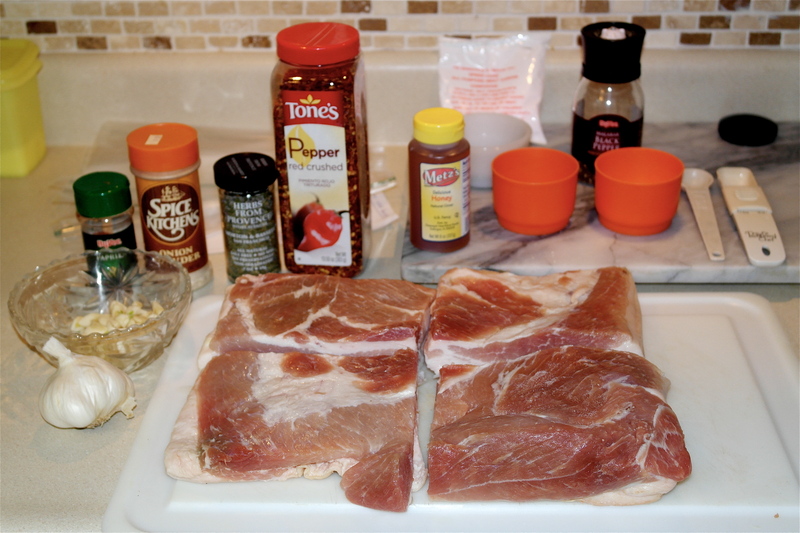 This recipe uses what’s called a “speed cure,” and it take 7-10 days for the pork to transform into bacon. Through all this time, however, you might do about an hour’s worth of actual work. Pick and choose your spices. I typically just use whatever I have on hand. Below is the illustrated tutorial. For just the recipe text, scroll all the way down. You can get most of the ingredients at any old store. Depending on where you live, however, you may have to call local butcher shops to find your pork belly and your curing salt. In Iowa, I go to Johnnie’s Meat Market and get a 5 lb. belly for less than $20. Iowa’s easy, though – we have more pigs than people. Up in Minneapolis, however, many butcher shops give you a blank stare when you ask for skinless pork belly. I go to Everett’s Foods and Meats (which is an awesome store in the Powderhorn neighborhood) and pay more than $30 for a little over 5 lbs. A smallish pork belly (I think this one was 4.8 lbs.). 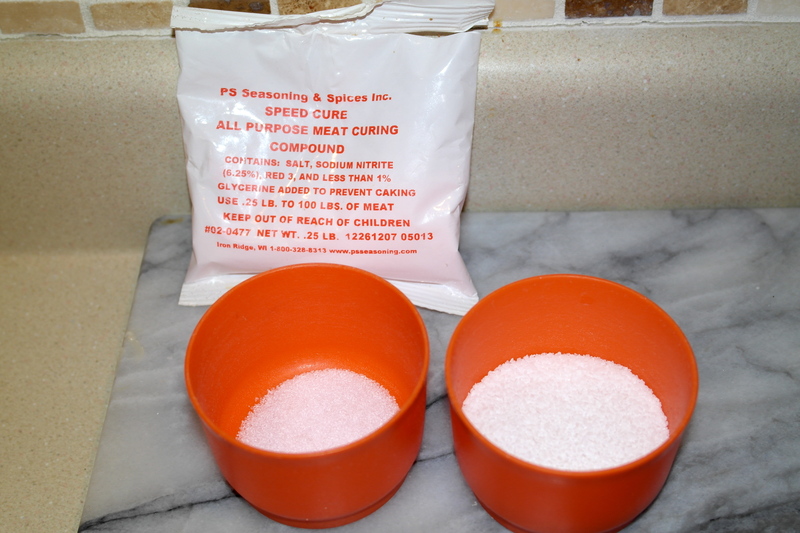 The curing salt is in the white bag with red lettering. Curing salt is sodium nitrite and includes dyes to make it easier to distinguish from regular salt. As you can see, this particular brand isn’t the super bright pink most curing salts are. You can just barely tell the difference between it and the regular salt. Sodium nitrite on the left; sodium chloride on the right. Slice the belly into quarters. It’s easiest to cut if it’s partially frozen. It also helps to have a giant knife. I only recognized this as a meat cleaver because of Psycho. Assemble your essentials as well as the spices you want to use. For my sugar in this cure, I used honey, but I’m usually more of a brown sugar/maple syrup type of person. I’d also like to try some molasses. The usual suspects: garlic (1 head’s worth of crushed cloves in the bowl), paprika, onion powder, herbs de provence, crushed red pepper, honey, curing salt and regular salt (in orange cups), and crushed black pepper. Now you just combine your ingredients in a container. 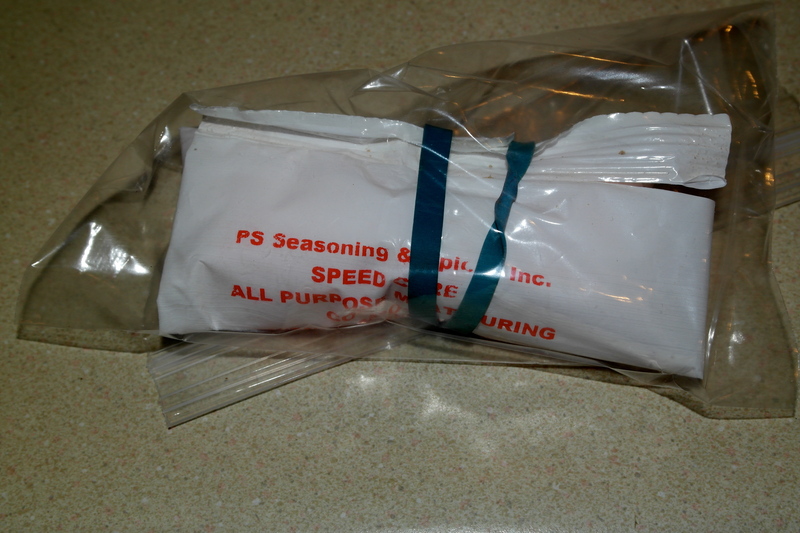 I’ve found the easiest containers are plain old 1-gallon Ziplock bags. I get four of them, put a quarter of the pork belly along with a quarter of the cure in each. Insert the meat first, then add each ingredient, making sure to get all the spices, etc. evenly distributed. You really want to make sure the meat is coated. Get your hand in there and rub the ingredients around if need be. Don’t forget to take care of your curing salt. Seal it up and store it in a cool, dry place away from your other salts to avoid any confusion. Sodium nitrite does not taste good on your eggs when you’re barely awake at 5:30 in the morning. Added precautions might be necessary, such as big eye-grabbing labels or burying it alongside the Ark of the Covenant. 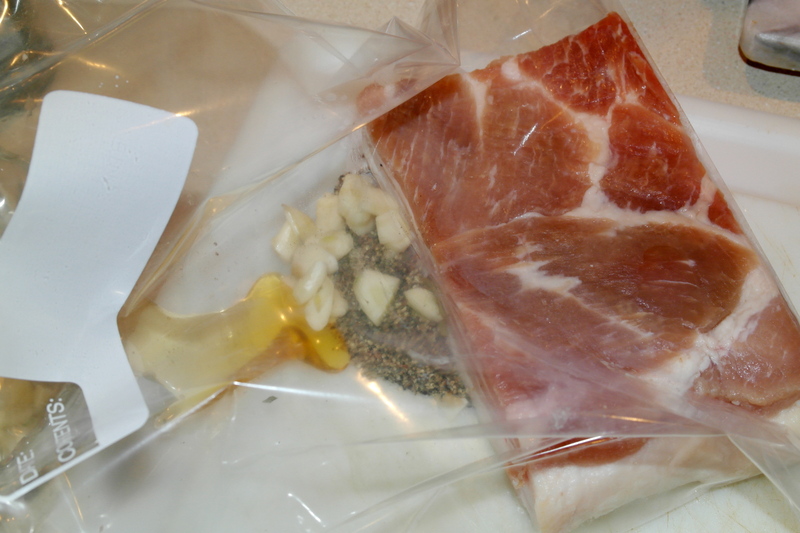 Let your bacon chill in the fridge for 7-10 days. Flip it over once every day or two. 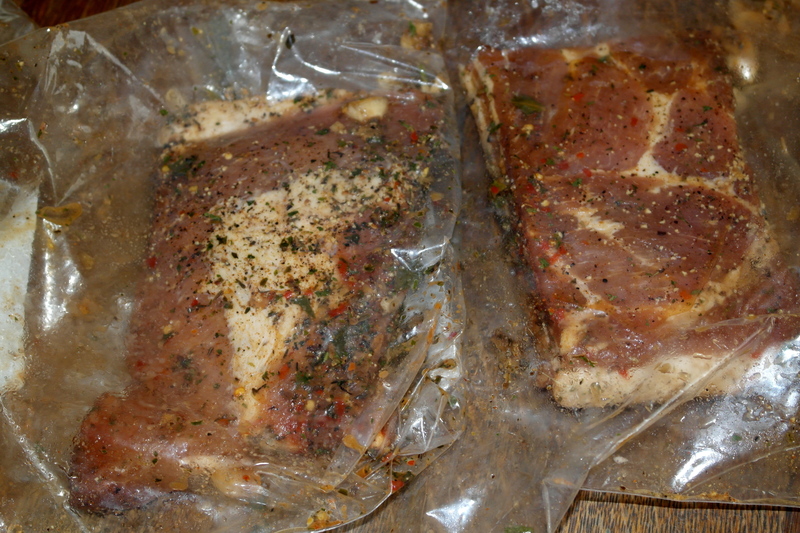 About halfway through curing, open the bags and rub the cure into the meat, making sure it’s good and coated. Not too bacon-y, but that’s because we haven’t cooked it, yet. I’ve listed instructions for roasting your bacon in the oven, as well as for smoking it using a smoker box and an outdoor grill. If you’re going to cook your bacon in the oven (which is not only easy but almost as tasty as smoking it), preheat your oven to 200 degrees Fahrenheit (93 degrees Celsius). 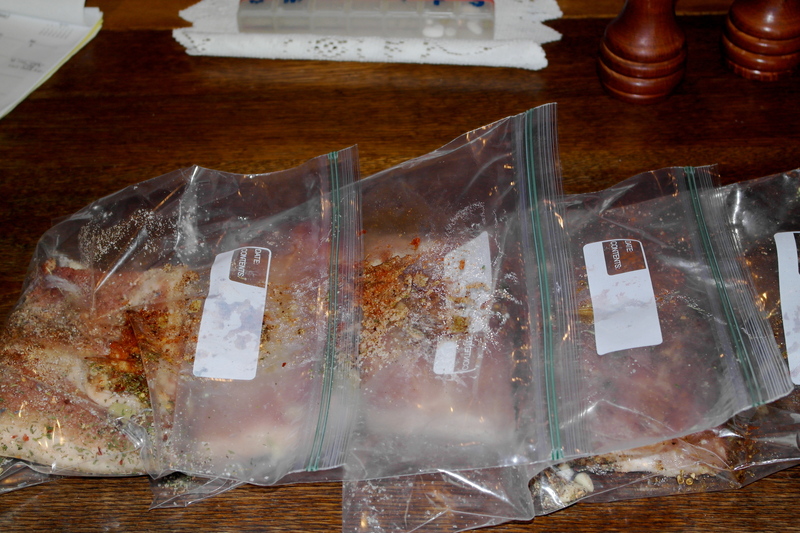 To prepare the meat for cooking, remove it from the bags and rinse off all the seasonings with cold water. Try to get it as clean as possible, but don’t worry about the few flecks of herbs here and there. This may not be a good project if you have severe OCD. 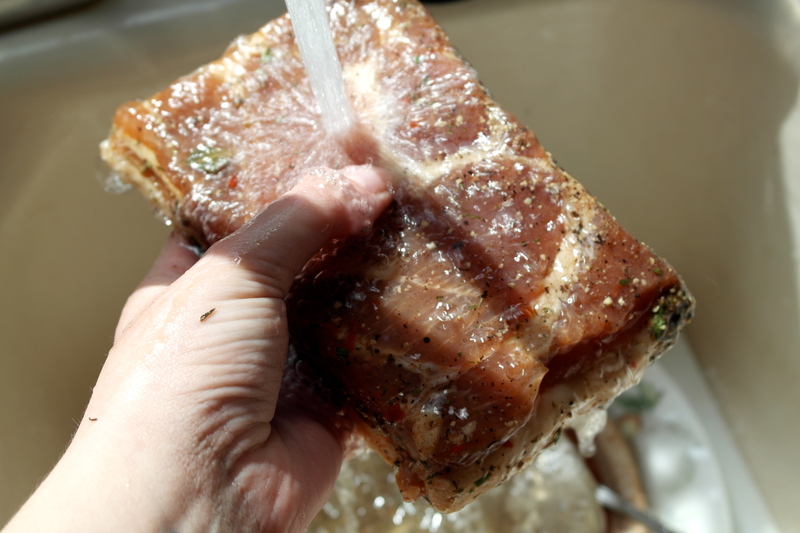 Once you’ve rinsed the meat, pat it dry with a paper towel. Then, it’s ready to go in the oven. This is after it cooked for a while – notice the drippings that have accumulated, which is why the aluminum foil is there to catch it. 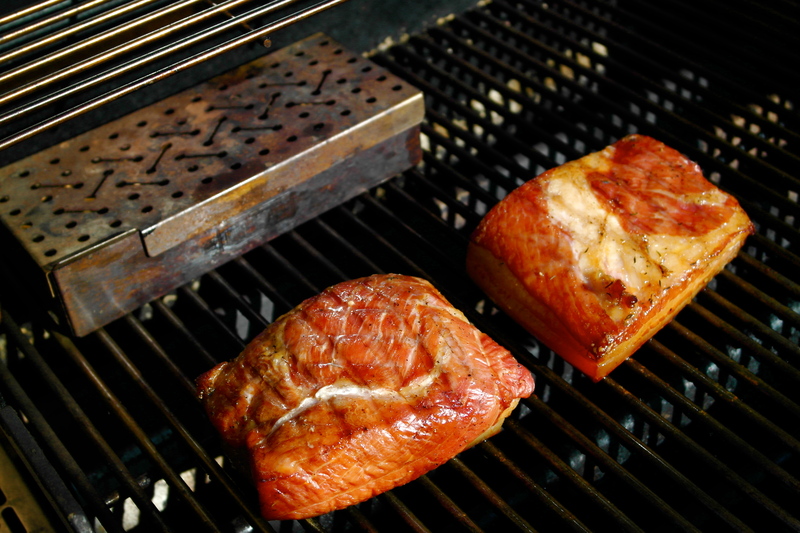 Wood smoked bacon over a grill is tastier and takes just a little more prep than oven roasting. You’ll need a smoker box, for one thing. 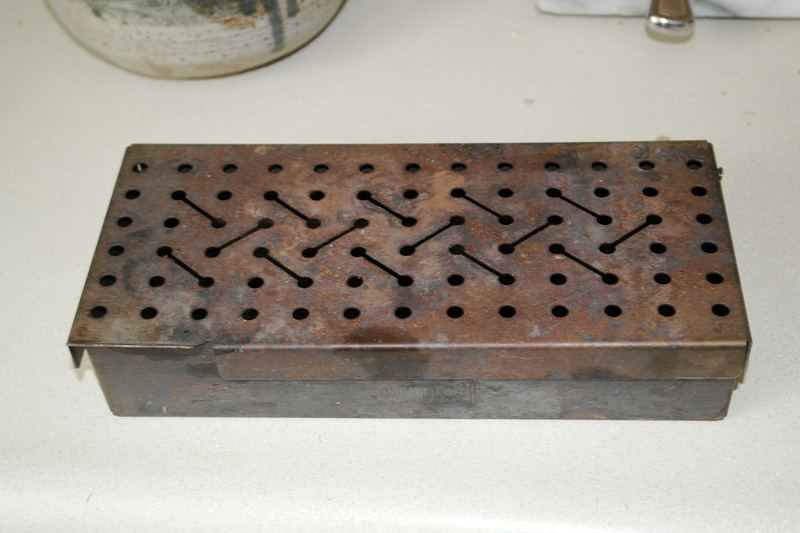 It’s just a metal box with holes in it. Soak your wood chips in water for at least an hour. Moisture is what makes them smoke, so don’t cut corners with this step. 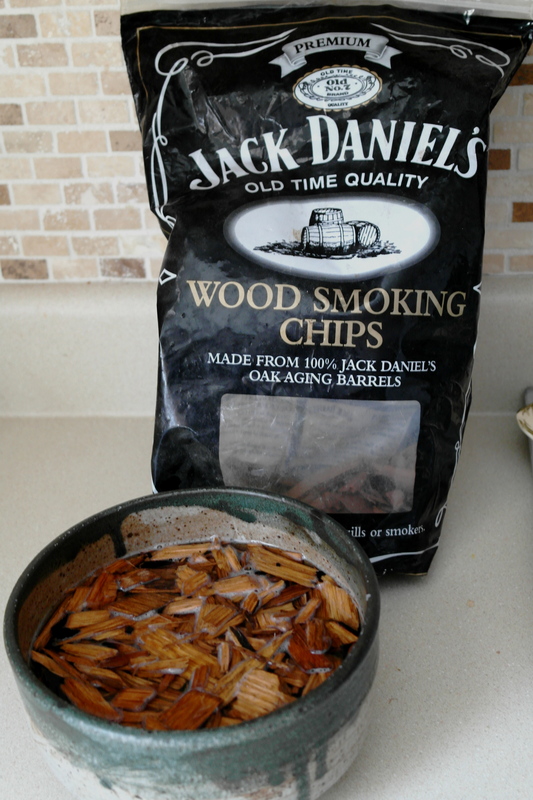 Jack Daniels Wood Smoking Chips: Because when it comes to pork, Iowans do not mess around. How you position your chips on the grill will depend on what type of fuel you’re using. If you have coals, the smoker box should rest directly on top of them. If you have a gas grill, let the wood chips sit over the flame until they start to smoke; then, move them so they’re only partially over the flame. This will keep them from burning up before your bacon’s done cooking. Let the grill get between 150-180°F (66-82°C). 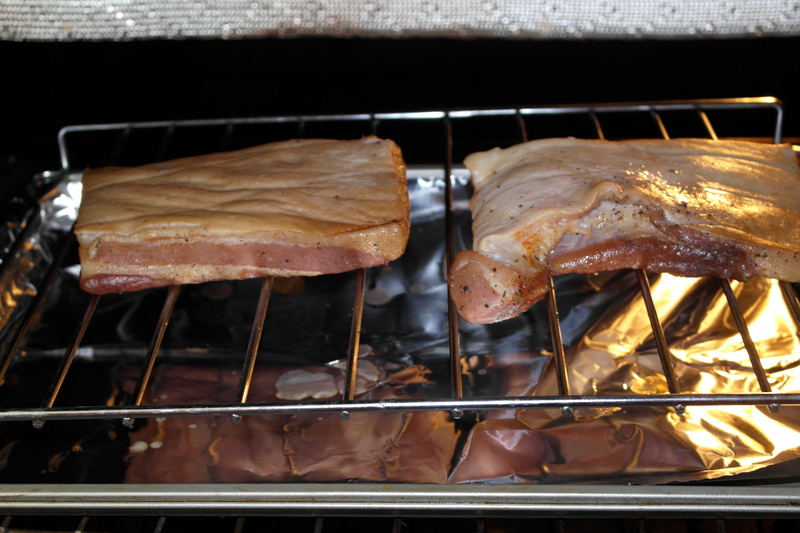 Once the heat is up and the chips are smoking, put your pork belly on the grill so it’s not directly over the heat source (i.e., the hot coals or the gas flame). Unfortunately, I was unable to capture the smoke coming out of the smoker box. Trust me, it was there. I have no words. The beauty is… indescribable. Once it’s cooked and cooled, let it rest overnight. Do not slice a bit off and fry it up right away. Ha! Just kidding. You know you’ve got to try some. I find it’s easiest to slice if I put it on its edge and slice down the length of the slab. Again, it helps if it is cold and/or partially frozen. Speaking of which, you can freeze this stuff for up to a year. In your refrigerator, it’ll last about a month. That’s assuming it survives all the breakfasts, sandwiches, and late night/early morning bacon cravings. 1. Get your 5 lb. 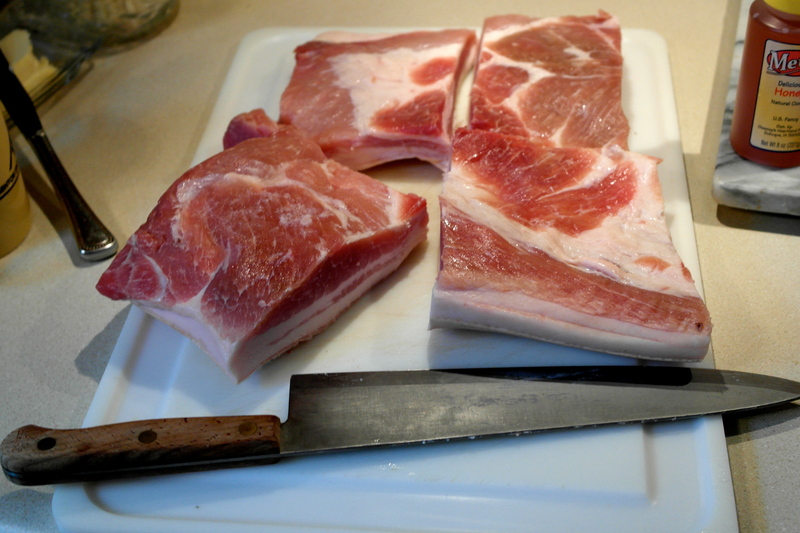 slab of pork belly and cut it up into four equal pieces. 2. Place each quarter into a 1-gallon Ziploc baggie along with 1/4 of the curing elements (that is, the salts, sugar, spices, and herbs listed above). 3. 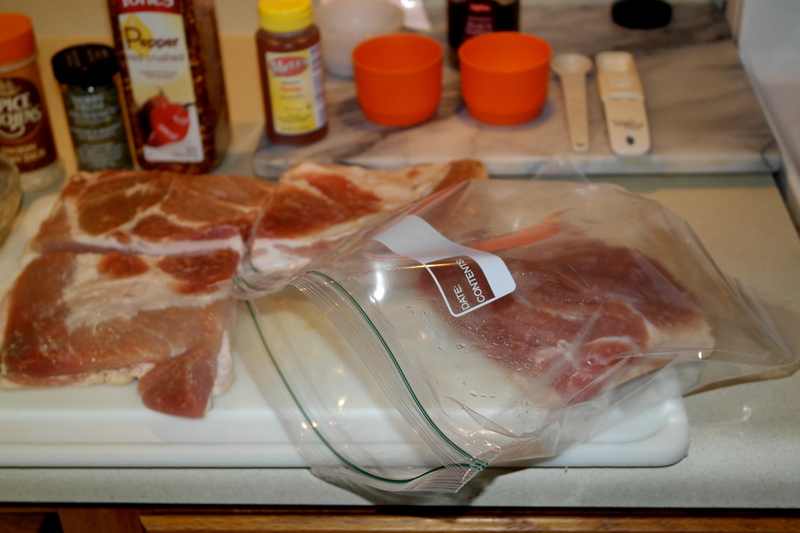 Mix the curing elements well in the baggie making sure the meat is completely coated. 4. Let rest in a refrigerator for 7-10 days. During this time, flip the slabs once every day or two. Mid-way through the curing process, open up the bags and rub the cure into the meat well to ensure your bacon has a nice, even flavor. 5. After the meat has cured for a week or so, it is ready to roast or smoke. Just prior to roasting/smoking, remove the meat from the baggies and rinse it well under cold water, making sure to get as much of the herbs and spices off in the process. After rinsing, pat the meat dry with a paper towel. To roast in the oven: Preheat the oven to 200 degrees Fahrenheit (93 degrees Celsius). 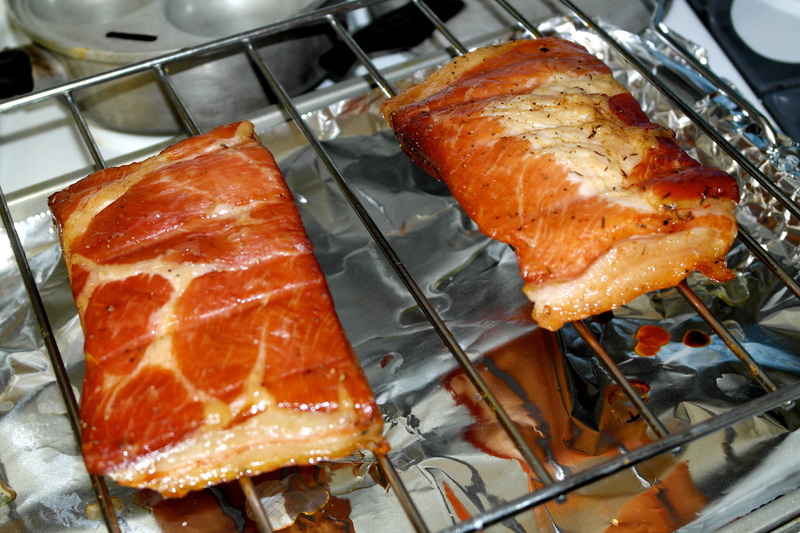 Place the meat on a rack (with some aluminum foil or a pan underneath to catch drippings) and let it cook for 2+ hours or until the slabs have an internal temperature of 150°F (66°C). Rotate and flip the meat every 45 minutes. 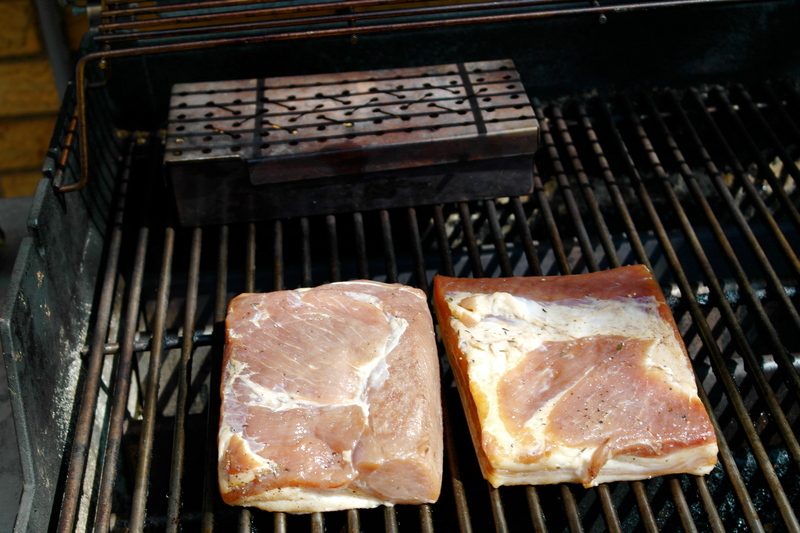 To smoke on a grill: Using a smoker box with your choice of wood chips or chunks, cook the bacon on an outdoor grill set at 150-180°F (66-82°C). Rotate and flip the meat every 45 minutes. Depending on your grill temperature, your bacon should take 3-5 hours to cook, reaching an internal temperature of 150°F (66°C). 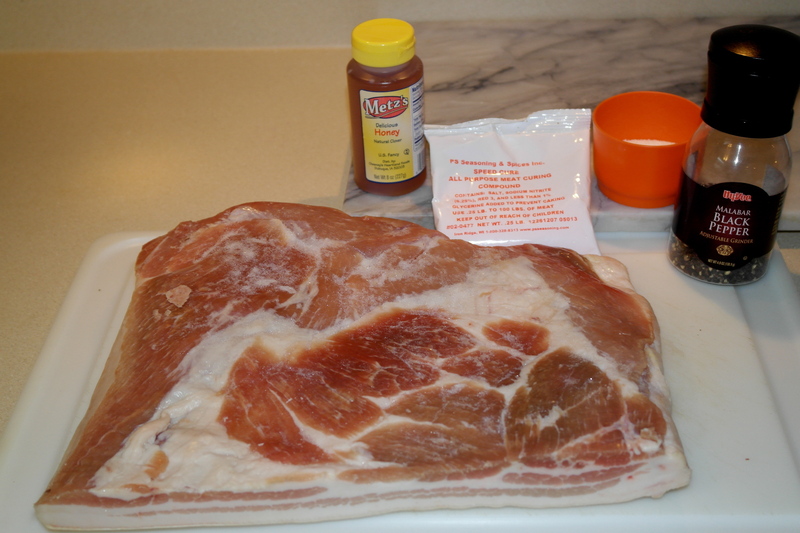 If you like this recipe, please help me to spread the Gospel of Home Cured Bacon. It makes me sad when I think of how many people in the world are eating inferior breakfast meats. Also, I am interested in feedback because I am toying with the idea of putting together a small cookbook of easy, low-budget meals that are robust yet healthy. Next Post What Is Mental Illness?